FREDERICTON, N.B., October, 15, 2014 – An investment in UNB’s faculty of education will establish scholarships, bursaries and a summer camp for Aboriginal students as well as salute the contributions of former Canadian Prime Minister Paul Martin. Through a generous gift of $500,000 from Drs. John and Judy Bragg, scholarships and bursaries will support Aboriginal students in the faculty of education. Additionally, a portion of the gift will establish an initiative to invite Aboriginal high school students in Grades 10 and 11 to UNB for a camp each summer. John and Judy Bragg are the founders of the Bragg Group of Companies which operates Oxford Frozen Foods, an industry leader in the processing of wild blueberries and other agricultural products. 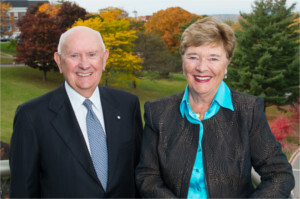 Along with their entrepreneurial expertise, John has been recognized by many universities, including an honorary degree from UNB in 2014 and Judy has received an honorary degree from the University of Prince Edward Island in 2010. Together, they have developed The John and Judy Bragg Family Foundation, a philanthropic endeavor which is dedicated to education and many other areas of community support. UNB’s faculty of education provides a rich academic and professional environment that has helped shape education curricula and programs in New Brunswick, Canada and around the world. A mainstay of the Faculty is the Mi’kmaq Maliseet Institute, which is celebrating its 33rd year. The Institute was formed to promote the professional growth and self-determination of the Aboriginal communities through its programs, services and research. "We believe in, and strive toward, improving the social and economic strength of Aboriginal Peoples to a level enjoyed by other Canadians," said Dr. Ann Sherman, dean of the faculty of education. "Initiatives such as those being announced today as well as the continued influence of education will play critical roles in reaching those goals. The scholarships and bursaries will be named in honour of Dr. Paul Martin, a close friend of the Bragg family and advocate for Aboriginal issues. Dr. Martin received his honorary degree from UNB during the 2013 Fall Convocation in Fredericton. He founded the Martin Aboriginal Education Initiative to improve elementary and secondary school education outcomes for Aboriginal Canadians. Using data from the 2011 Canadian census, the Martin Aboriginal Education Initiative reports that while approximately 26.5 per cent of non-Aboriginal Canadians have a university degree, only 11.7 per cent of Métis Nations, 8.7 per cent of First Nations and 5.1 per cent of Inuit Canadians have a university degree. Further, the high school drop-out rate for Aboriginal students on reserves is 60 percent, a figure that drops to 43 per cent for Aboriginals off-reserve. The high school drop-out rate for non-Aboriginal Canadians is 9.5 per cent.